A man exits a restaurant after he looked for his belongings. 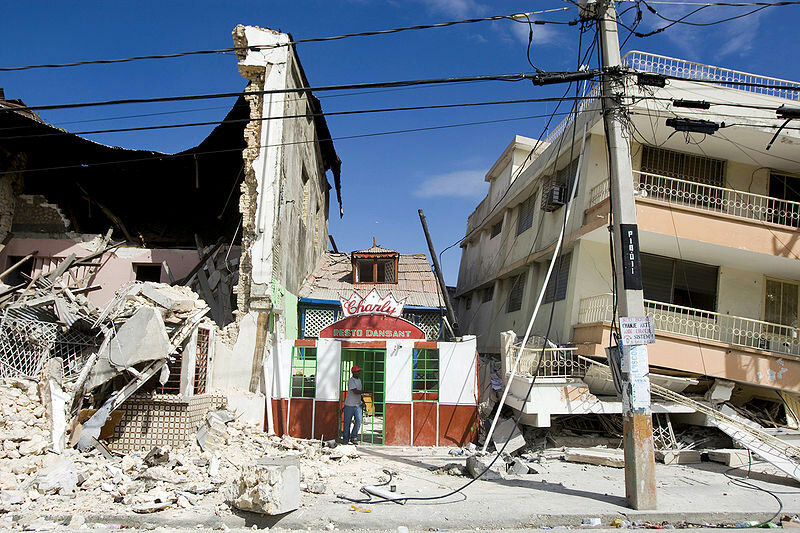 A 7.0 earthquake rocked Port au Prince, Haiti on January 12, 2010. It's not your imagination. More earthquakes than usual have struck in 2010. Because many events clustered together during the first seven months, it furthered magnified the data. If this increased trend maintains through the last two months of 2010, it could further push quake stats. Something unique occurred July 23rd. Three massive earthquakes  7.3, 7.6 and 7.4  struck the Philippines in rapid succession, like seismic gunfire. Since then thousands of aftershocks have hit the same area. Quakes don't have to peg the largest magnitude to bring utter destruction. Look at January's Haiti event. That 7.0 event is responsible for this year's massive death toll. "The cost of rebuilding Haiti’s homes, schools, roads and other infrastructure could soar to nearly $14 billion." As of Oct. 13, 2,000,000 people were still homeless. Quakes clustered in several places around the U.S. this year  the most recent in Arkansas with more than 100 temblors since last month and more shakes are added daily. Oklahoma also experienced unusually high quake activity this month including a Richter 4.3. Speculation raised the question that these might have been human-caused, but scientists dismissed the theory on Monday. Though the largest event only produced a Richter 4, the area bears watching as it includes the New Madrid Seismic Zone. Another intensive swarm hit southern Calif. in July and it continues today. These events coincide with the current quake series in Mexico. Earlier in the year, yet another swarm clustered at Yellowstone. It managed to chalk up over 1500 shakes before quieting again in February. Outside the country, Christchurch, New Zealand saw a record-breaking (for them) 1445 earthquakes following a 7.1 temblor that struck early last month. Last year a 30,000-strong swarm pummeled Saudi Arabia. To scientists' surprise, these temblors revealed that the area is "unexpectedly volcanically active". Lava is just a mere 2km below surface. This is how worldwide earthquakes stack up to date. Not only has a significant amount of quakes occurred, but extraordinary numbers of people have perished in them. Over a quarter million lives have been lost this year when only 10,000 is expected.